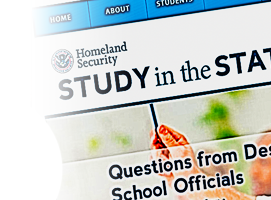 The Department of Homeland Security plans to raise the fees paid by international students from $200 to $350, and the fees paid by newly certified schools for foreign students from $1,700 to $3,000, according to a report by Elizabeth Redden in Inside Higher Ed. This news should be greeted with two, not three, cheers. It is good that the management of foreign students should have adequate resources, and the 75 percent fee increase for the students will bring in many tens of millions of dollars to DHS for this purpose. I particularly welcome the fee increase for the new schools — a minority of whom are bound to create problems in the immigration field. On the other hand, the DHS agency that regulates foreign students, the Student and Exchange Visitor Program (SEVP), has proved in recent years to be totally passive regarding the plethora of visa mills it should have terminated. Visa mills are marginal educational institutions, usually for-profit, that grant work permits to foreign students in exchange for tuition payments, with a modicum of education thrown in for show. Although an SEVP license is essential for the visa mills to operate, the agency has done little if anything in recent years to shut them down. Usually, after a delay of weeks or months from the time a place is closed, most often by state government action, SEVP eliminates the school's listing on its "Study in the States" website. In the meantime visa-issuing officials, who rely on the list to tell them what colleges are, in fact, legitimate, may continue to issue visas for what has become a ghost institution. As an example of how relaxed SEVP is on visa mill matters, let's look at the fine print on the (correct) decision of a troubled accreditation agency, the Accreditation Council for Independent Colleges and Schools. Dealing with California visa mill Silicon Valley University (SVU), which had "lent" its departing president and his wife $14 million, ACICS decided that SVU's persistent refusal to provide ACICS with an audited financial account should lead to one of ACICS' rare decisions to revoke accreditation. The decision was conveyed on December 17, 2017, when ACICS sent a letter to SVU telling it that it was no longer accredited. As has been its practice with similar letters, ACICS sent copies of that letter to two officials at the U.S. Department of Education, but none to anyone at SEVP, a telling omission. Maybe — if it is interested, as it should be — SEVP could use some of its newly found resources to let ACICS and other accreditation agencies know that it is interested in such decisions, and ask to be informed about them in the future. Ideally, SEVP would use some of its new millions to hire some young people, preferably with the appropriate accents, to pretend to be F-1 students, who would attend these schools and report first-hand on the schools' behavior. But, again, don't hold your breath.